Size of Male: 13-17 lbs., 12-14 in. Size of Female: 13-17 lbs., 12-14 in. A feisty terrier that can take on dogs 10 times larger than its size, the Parson Russell Terrier is the right choice for the seasoned, athletic and able pet owner. The breed is more energetic than fox terriers and more hard-working than Border Terriers combined! This intelligent and mischievous trouble maker is sure to make your home a tad less welcoming to intruders. The beginnings of the breed date back to mid-19th century England. The dog descended from a pet owned by fox hunting enthusiast and Oxford University student Parson John “Jack” Russell. Russell reportedly wanted to breed a canine that could handle foxes and bolt as fast as horses. Indeed, the breed made a fine showing in the field, but was relatively unheard of in shows. This was because Russell – for unknown reasons – chose to keep his discovery a secret! The pooches were known as Jack Russell terriers until 2003. Enthusiasts explain that the Jack Russells which you often find in stables are short-legged, whereas the dogs that carry the name Parson Russell reflect the traditionally taller and long-legged conformation. The Parson Russell is a bag of energy, mischief and volatile mood. Though not a huge dog, the terrier possesses the confidence of canine giants. Expect plenty of chasing, digging, barking and mouthing behavior from the breed. You do not want to adopt other pets – not even another Parson Russell – when you have one already in your home. Even the minutest provocation can spur the pooch to aggression! Living Environment – Rowdiness makes this dog breed unfit for apartment dwelling. In fact, a very secure yard is suggested where the pooch can expend an amazing amount of energy. 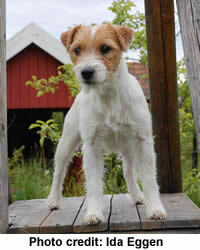 Inside your home, keep any valuables, prized furniture and moving objects out of your Parson Russell Terrier’s sight. You may want to restrict a few rooms, too. The Parson Russell can voraciously chew on things that catch its fancy. Grooming – Parson Russell Terriers can be smooth, rough or broken coated. Because the dogs shed regularly, you must brace yourself for daily vacuuming. The breed, however, is not that demanding to maintain. Regular (not necessarily daily) brushing is required to de-shed dead hair. For the rough and broken-coated variety, bi-annual professional stripping is recommended. Diet & Exercise – Many dog owners advise an all-natural diet, but if this can’t be helped, choose a high-quality commercial brand for your Parson Russell. The dogs have a robust appetite to match their full energies, and must be fed at least 2 square meals a day. As you already know, the breed does require plenty of physical and mental exercises to remain well tempered indoors. A combination of dog training session, vigorous play time and long walks is strongly suggested. It’s best to keep your pooch on a leash while you stroll on open areas. A loose Parson Russell Terrier will deliberately ignore your calls just to satiate its hunting instinct. Health – Though healthier than other terrier breeds, the Parson Russell isn’t completely risk-free in the health department. There are chances that your pooch will suffer from late onset ataxia and orthopedic conditions such as Legg-Calves and luxating patella. Deafness is occasionally seen, as well as hereditary eye cataracts and lens luxation. Not just anyone can train a Parson Russell, but this doesn’t mean your pet is a slow learner. On the contrary, the breed is highly intelligent and quite obedient when socialized enough and handled by a dominant trainer. Parson Russells excel in tricks, fly ball and agility competitions. I have a Parson myself. His name is Jay and he is 4 years old.